Last week, October 25, was myÂ birthday. Thank you to everyone who donated toÂ NutritionFacts.org, which I began as a labor of love dedicated to my grandma’s near miraculous recovery from heart disease thanks to lifestyle medicine pioneer Nathan Pritikin. Thatâs why I went into medicine, thatâs why I started NutritionFacts.org, that’s why I wrote How Not to Die, and thatâs why 100% of the proceeds I get from my books are all donated to charity. I just want to do for everyoneâs family what Pritikin did for my family.Â If you still want to help celebrate my journey, you can make a tax-deductible donation to keepÂ NutritionFacts.org exploding out into the world. My new DVD is out today and is available as a streaming video so you can start watching it immediately. As you can see,Â there’s a variety of topics covered, from eggs and breast cancer, “vitamin B17,” light vs. dark roast coffee, and the best foods for bad breath. All of these videos will be rolling outÂ for free online starting at the end of November, but if you don’t want to wait, you can watch them all streaming right now. You can also order it as aÂ physical DVD. Anyone signing up on theÂ donation page to become a $25 monthly contributor will receive the next three downloads for free, and anyone signing up as a $50 monthly contributor will get a whole year’s worth of new DVDs (as physical DVDs, downloads, streaming, your choice). If you signed up for physical copies, and do not yet have it, please email [email protected] and we’ll make everything all better. In the last dozen years I have created more than 1,500 videos. How often have you seen me on my Live Q&A’s saying “I’ve got a video on that!”? There’s such a treasure trove of life-changing information now that I’ve decided to start digging into the video vault and bringing back some of the classics, complete with an updated Doctor’s Note on Fridays, startingÂ Nov 9. I need your help in choosing which videos to feature on Flashback Fridays. What are the favorites you’re always sending to family and friends? What videos changed the way you live your life? What were some of the most interesting, groundbreaking, practical findings you learned? Please let me know by voting here. Dr. David Katz just came out with a new book,Â The Truth About Food: Why Pandas Eat Bamboo and People Get Bamboozled.Â All book proceeds go to a great charity (the True Health Initiative). A man after my own heart! 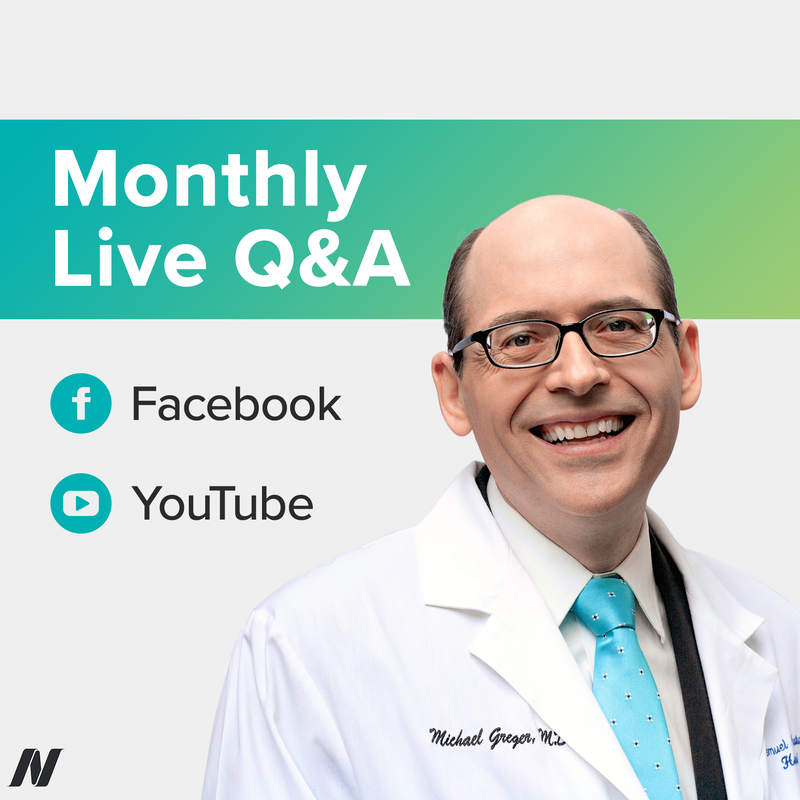 Every month I do Q&As live from my treadmill, and November 15Â is the day. You can find links to all of my past live YouTube and Facebook Q&As rightÂ hereÂ onÂ NutritionFacts.org.Â If that’s not enough, remember I have an audio podcast to keep you company at http://nutritionfacts.org/audio.